A former vice president of Zimbabwe, Joyce Mujuru, has been expelled from the ruling party, Zanu-PF. The party said she had plotted to remove President Robert Mugabe from office and brought the party into disrepute. She had been been seen as a likely successor to President Mugabe but was sacked at the end of last year. Mr Mugabe, 91, will have been in power for 35 years when Zimbabwe marks its independence from the UK later this month. The first lady, Grace Mugabe – who is now a senior figure in the Zanu-PF Party – has been very vocal against Mrs Mujuru in public. Mrs Mujuru fought alongside Mr Mugabe in the 1970s guerrilla war against white minority rule and was known as “Spill Blood”. Zanu-PF spokesman Simon Khaya Moyo said in a statement that the ruling party’s top decision-makers had agreed to her dismissal citing 10 reasons. These included plotting to remove Mr Mugabe from office, alleged corruption and bringing the party into disrepute – charges she has previously denied. “The politburo felt that she lacked the quality of strong moral principles, honesty and decency and therefore ceases to be a member of Zanu-PF,” Mr Moyo said. 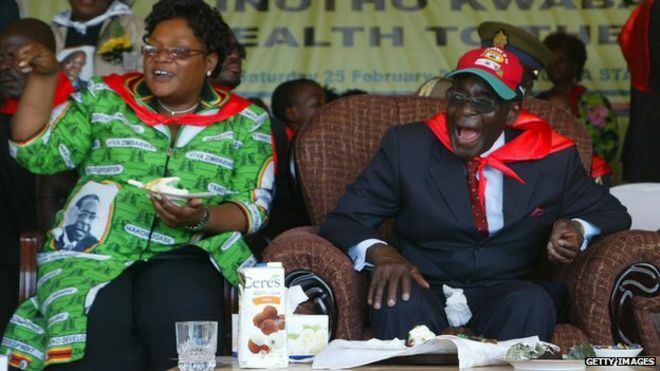 Mr Mugabe has not publicly indicated a preferred candidate to take over his presidency.But in December he purged the government of several ministers, including Mrs Mujuru, and appointed Emmerson Mnangagwa as his deputy, making the former justice minister the favourite to succeed him. Didymus Mutasa, one of the sacked ministers and a former confidante of President Mugabe, was expelled from Zanu-PF earlier this year. He has told the BBC’s Focus on Africa programme that he now fears for his life.”You see people disappearing… so will they spare my life or send a sniper to shoot at me?” he said. He said the fighting in Zanu-PF was worse than the situation under former white minority leader Ian Smith.”The Smith regime was not as bad as the current regime – it’s really terrible,” Mr Mutasa said. Posted on 5th April 2015 by newsafrica. This entry was posted in Africa, Grace Mugabe, President Mugabe, Zimbabwe and tagged Didymus Mutasa, Emmerson Mnangagwa, Guerrilla warfare, Joice Mujuru, Robert Mugabe, Ruling party, Solomon Mujuru, Vice President of the United States, Zimbabwe, Zimbabwe African National Union – Patriotic Front. Bookmark the permalink.